There have been 9 movies created (or mutated) out of the X-Men universe. 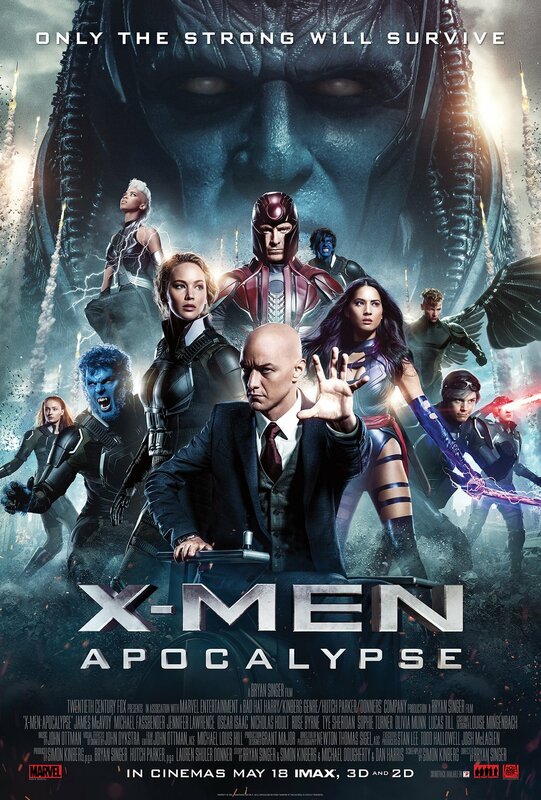 This year we got 2, the unbelievably great DEADPOOL and now, X-MEN: APOCALYPSE. The latter had a bigger budget, bigger cast and bigger expectations. APOCALYPSE introduces us to what some call the world’s first mutant. He goes by many names, but Apocalypse seems good enough. He moves his consciousness from body to body throughout time. At the start of the movie, he is being transferred into Oscar Isaac when some really smart Egyptians try to destroy him. No destruction, but he is entombed in the rubble of a pyramid. That is until Rose Byrne essentially wakes him up. Oops. Yes, Byrne’s Moira McTaggert is back after skipping DAYS OF FUTURE PAST. Her CIA investigation into what some fringe Egyptian clerics are doing goes really wrong. Meantime, there are several other mutant storylines unfolding. And we are introduced to several new mutants not seen in the reboot that started with X-MEN: FIRST CLASS. Scott Summers (Cyclops), Kurt Wagner (Nightcrawler) and Jean Grey (Jean Grey) all show up. Mystique is trying to find mutants all over the globe because even though everyone says they are ok with mutants now, she believes they are just tolerating them until another solution presents itself. Magneto is married with a kid and working at a steel mill in Poland, until his mutant powers reveal themselves when he saves a co-worker. Oops again. They hunt him down (see, Mystique was right) and inadvertently kill his wife and daughter. Now Apocalypse is busy gathering his 4 horsemen (get it?). They are Storm, Psyclocke, Angel and Magneto. The plan is to disarm the world, then take it over. But Professor X is trying stop him. So, once again he is pitted against his old friend Magneto. So you have to pay attention to who is siding with whom. Where alliances are shifting and what everyone’s real motivation is. The story gets a bit muddled at times, but the action never stops for very long. No long lulls for contemplating larger issues. That’s all handled pretty quickly, almost brushed off at times. Bryan Singer was in charge. Thank god (or Apocalypse). He knows this material and embraces it like other directors cannot. The script is pretty rote but is elevated by the cast. James McAvoy, Michael Fassbender, Jennifer Lawrence, Nicolas Hoult, and Isaac all turn in great performances. The newcomers hold their own, including Sophie Turner (Jean Grey), Tye Sheridan (Cyclops) and Kodi Smit-McPhee (Nightcrawler). We see a decent amount of Olivia Munn (Psylocke) and Alexandra Shipp (Storm), but other than looking menacing and hot in their skintight outfits, they don’t have much to do. The movie works on several levels. There is a great cameo by another mutant, but I won’t spoil that. It’s great to look at. The stakes are high (aren’t they always in these Superhero movies?) and the conclusions are mostly satisfying. On the 2016 Hero Genre spectrum APOCALYPSE falls after DEADPOOL and CAPTAIN AMERICA: CIVIL WAR, but way ahead of that other franchise that Zack Snyder has ruined so badly I refuse to name it.